The first of May is historically and culturally more important in Europe than in North America, rooted in ancient pagan celebrations of spring sometimes mixed with some modern political overtones. I briefly indulge in some fond memories of some of the Finnish traditions I grew up with but no longer practice. Instead, I take sweet pleasure in the wild abandon and abundance of a long spring, the best time of year in this balmiest part of Canada. Here are a few glimpses of what is in my backyard: lilac entwined with rampant clematis escaping from the fence behind it, and what I call wild bleeding heart that is everywhere for such a brief time, mixing with the bluebells and the lily of the valley… like a wild woodland garden. I wish you all a Happy May Day, Hauskaa Vappua, Happy Walpurgisnacht and Bonne Fête du Muguet! Missed 2009, for we were in the UK. In fact that was the fantastic day I met several blog friends! Marja-Leena, was it really a year ago that you came over to my place in London and that we were all in the pub across the street? I wish we could repeat the event every year but not today as it’s cold and pelting down with rain. Have a happy May amidst your gorgeous flowers. Thank you for the bluebells in your last post and for these seasonal photographs. The month of May seems to have penetrated the lense of your camera with its merriment and fragrance. Oh, Walpurgisnacht … haven’t thought about that for years. It was a fun time in my family when I was a little girl. Happy May Day, Marja-Leena! P.S. 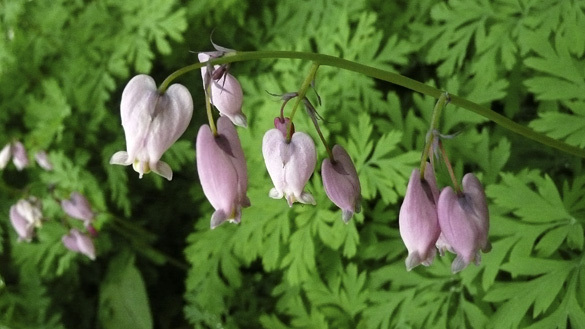 The bleeding hearts in my mother’s garden are white this year. Natalie, yes, how the year has flown! I hope we’ll come again while our daughter and family still live there, and who knows maybe it will be permanent. Sorry to hear about your weather, we’ve been having a lot of rainy days too, like today. Joe, thanks, we do share a love of gardens. R, how did you celebrate Walpurgisnacht in your childhood? I’ve seen white bleeding hearts in the garden shops, and I remember the traditional one in my mother’s in Winnipeg. These wild ones are rather insipid and weedy in comparison but prolific. Even our lilacs are gone now but the roses are budding. It’s a delight to see your pictures of spring flowers in your beautiful garden. 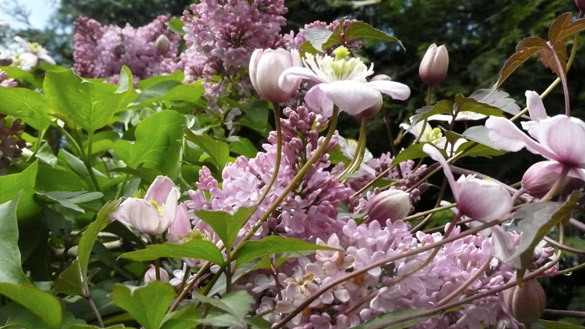 I can almost smell the lilacs – did you know an “everblooming” variety called “Bloomerang” is supposed to continue blooming through the summer until frost? A belated Happy Mayday. When I was a little kid we still had Mayday celebrations where we danced around the Maypole. But I guess the reason the powers that be in the U.S. gloss over Mayday these days is its association with the workers’ movement. Susan, spring’s forward march has slowed down a bit with colder spells so that lilac is taking its time, as are the rosebuds! Loretta, I have not heard of an everblooming lilac, I’d love that! I wonder if it would grow here and if it’s available – must look! Hattie, thanks for the wishes. I think there were some community groups doing a MayPole dance yesterday, as were some worker’s protests as well. Mild stuff compared to what goes on in Finland and parts of Europe, not always pretty! Julia, same to you and your family! Our youngest used to say when she was small, ‘happy new month’ every time the calendar page turned. Hi Arle, sounds like your weekend was wonderful. We had a quiet at-home one, gardening on a lovely Saturday, and puttering around indoors on a very rainy, stormy Sunday. Our clematis (montana — that same common variety as yours) is just beginning to come into bloom. The bluebells, lilac, wisteria and bleeding hearts are all out, too. I find it comforting to think of sniffing and enjoying the same flowers, despite all of the thousands of miles between our two homes. Today, I visited Regent’s Park and was much dismayed to realise that I hadn’t put the (freshly charged!) battery into my camera. I will have to visit there again when the roses bloom. We were standing in a shop of Marylebone High Street and I saw huge specks of white swirling outside the door. For a moment I thought that it was snowing . . . and then I realised it was BLOSSOM. Ah Bee, now you are making me long for London as well as Paris! Yes, it is wonderful to think of us enjoying the same flowers. I don’t have any wisteria but the roses are in bud. 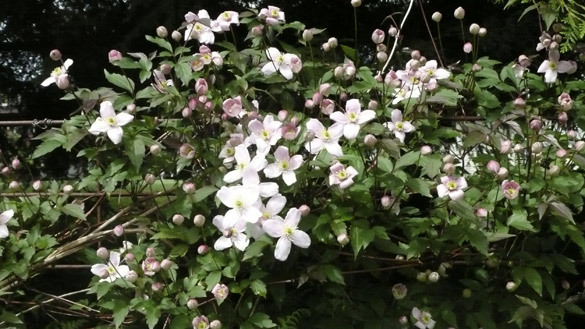 The clematis montana is a quite a spreading prolific one. This is from cuttings I took of the original ancient one which was growing next to the house, and good thing for one spring it died. The lilacs are in full bloom here as well. I keep walking past (or under) lilac bushes and inhaling their heady scent. The lily-of-the-valley are up as well, and just about to open. It’s such a wonderful time of year. Happy May to you! Leslee, it is the BEST time of year, especially where you experience a real winter. Enjoy all that it offers! Belatedly, a happy May to you! We seem to have longed for spring for so long, and now it is racing away already. I’ve a very elderly friend who says every year that he’s never seen a spring like it, I wonder if it moves us more each year like that? Lucy, thanks! That could be, as our memories fade a bit with age. This year I’ve been saying my rhododendrons and certain other flowers have been exceptional because of our mild winter, though spring has been cold. Last year we had such a hard winter, like you this year, that much in the garden suffered and there were some losses even. Regardless, spring is the most special season, isn’t it? beautiful flowers! your yard must be heaven. Taina, thanks, it’s a pleasure in the spring with so many things coming to flower one after the other from January until summer. We’re lucky to live in this climate. We inherited this garden 26 years ago and I’ve added and changed this and that over the years.